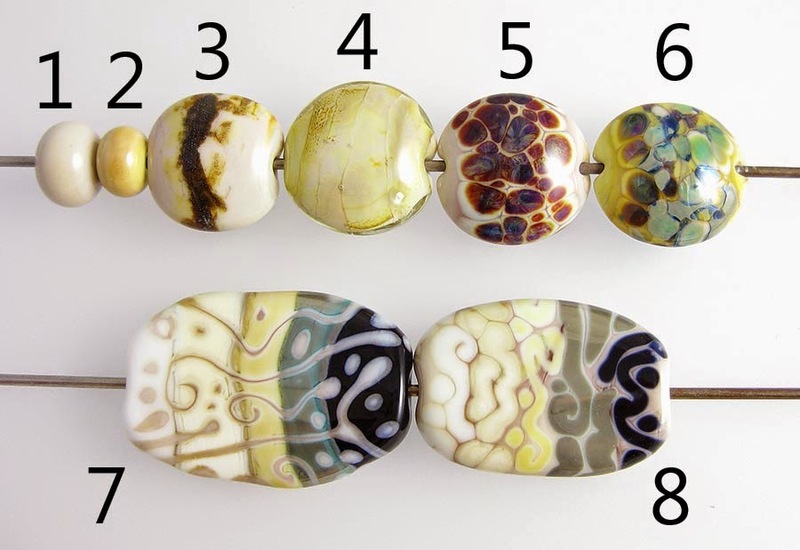 1 - Plain, 2 - Plain (reduced), 3 - w/ Silver Leaf, 4 - w/ Silver Leaf (reduced & encased), 5 - w/ TerraNova2 Frit, 6 - w/ Silver Glass Frit (reduced), 7 & 8 - w/ Peace, Ivory, Opal Yellow, Copper Green, and Tuxedo. Effetre Wood (Legno) is a weird colour. Legno is the Italian name, and Wood is the translation, although some vendors are calling it by both names, e.g. Wood Legno, or Wood Wood. Its rods are Ivory in colour, so you expect certain things from it on first use that simply don't materialize. While Wood is a reactive colour, it is not reactive like you would expect an Ivory would be. It's more like a pink or a brown in terms of how it behaves, and I'll walk you through how very odd it is, below. 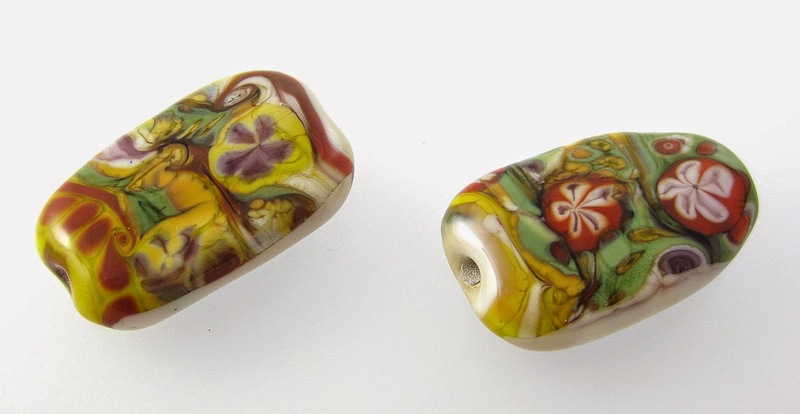 In these beads you can see the plain Wood spacer on the left, and then the reduced version on the right. Reducing fumes this colour an orangey yellow colour. When silver is used on top of Wood, it turns a dark copper colour and mashes itself into a narrow band. You can also see strange brownish smears over the bead where the silver has made the Wood react. 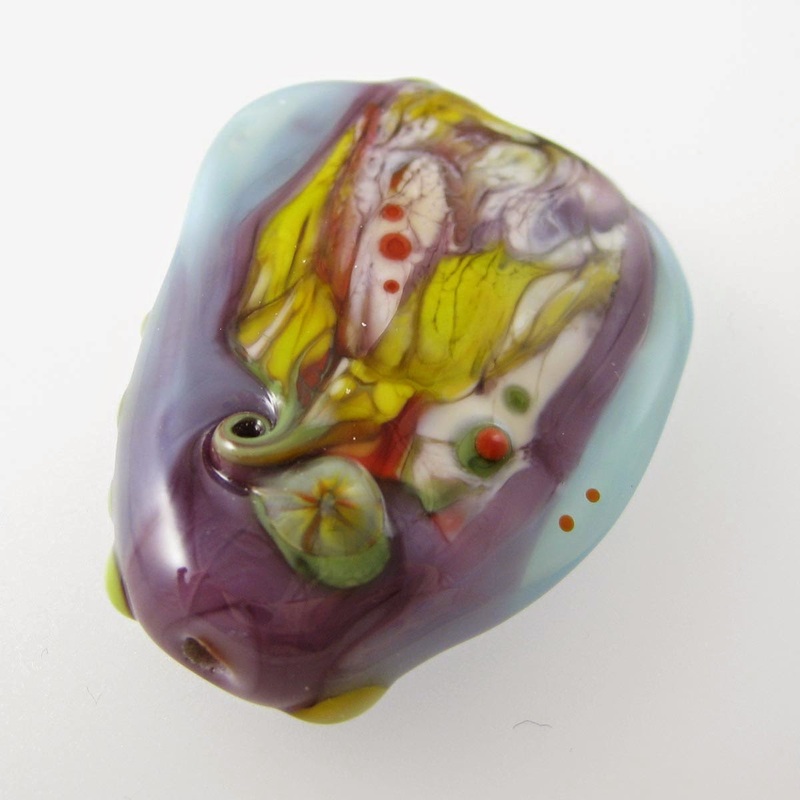 In the bead on the right, I reduced and encased the silver reaction which resulted in a strange, pinkish green ethereal effect under the clear that is interesting but not very attractive. 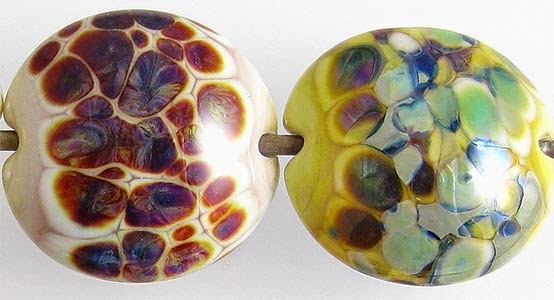 And while Wood is not very beautiful with the silver glass in either of these test beads, it is clear that it is a highly reactive colour from the way it has retreated from the fritty bits and formed pale bands around them. When I used Wood on top of other colours, it without exception has turned a beige colour, but not uniformly. On top of Peace, Wood looks almost like a pale clay colour, which I find really attractive. The dots and stringer lines are a little mottled but still nicely defined. Peace (like both Ivory and Opal Yellow) spreads out on top of Wood like crazy. 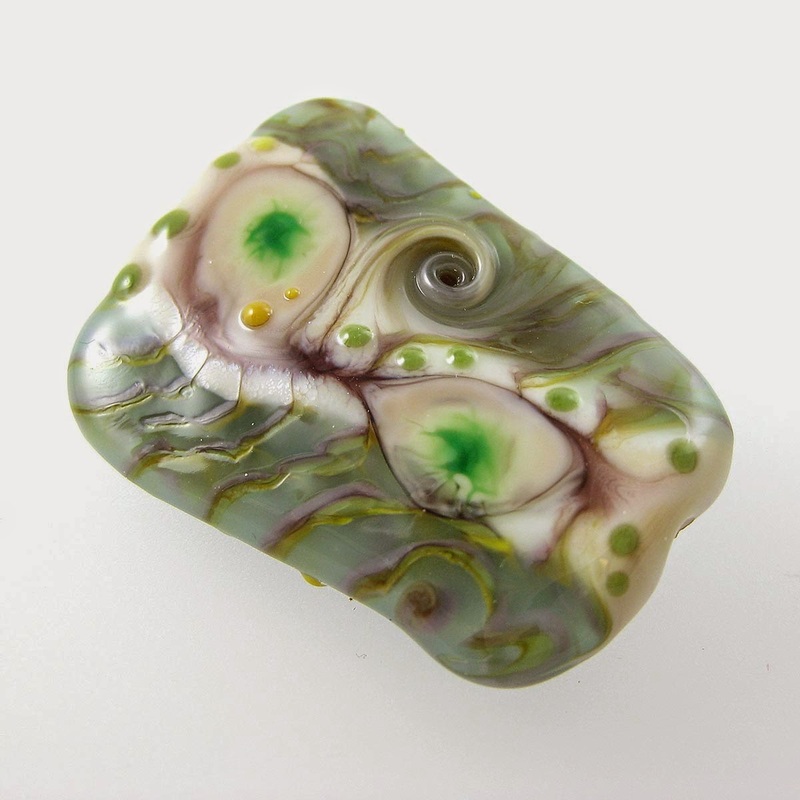 On top of Ivory, Opal Yellow, and Copper Green, Wood separated into two different shades of beige with the darker shade lining the middle of the dots and stringer lines. 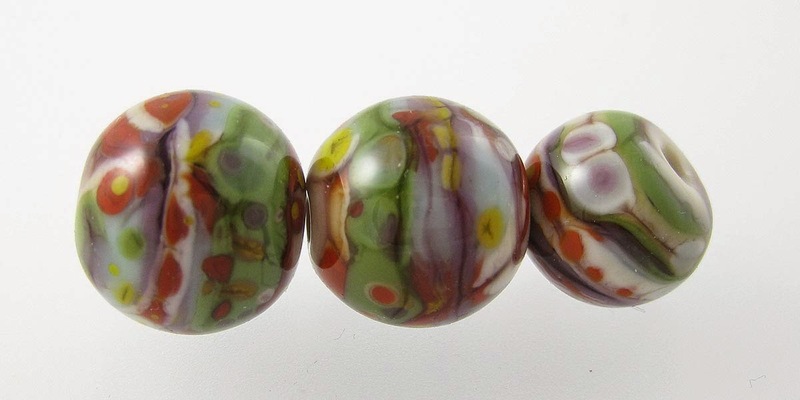 It looks more brown on top of Ivory, is a dark pinkish beige on top of Opal Yellow, and a mellow beige with larger separation rings on top of Copper Green. 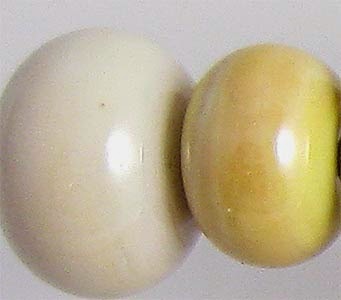 Opal Yellow separates into two different colours of Wood (brighter with a pale border) on top of Wood. When Copper Green is used on top of Wood, a faint halo of pale beige rises up to surround the dots and stringer lines. On top of Tuxedo, Wood separates as well, but it develops the darker part of the separation reaction on the outside of the dots and stringer lines which makes the reaction looks sort of out of place next to the reaction on top of Copper Green. It's like the line gets turned inside out on top of Tuxedo. The exterior of the reaction line on top of Tuxedo is also weirdly shiny. As a result of all the excitement in the leftmost bead, I was expecting a set of similarly interesting results in the bead on the right but what I found instead is that while Wood rose up in a subtle halo around Copper Green and Tuxedo, its main influence on all of the colours I tested it with was to make them spread like heck. The dots and stringer lines all look obese, considering the stringer I applied them with was no wider than the one I generally use, and very similar in girth to the one I used in the bead where the Wood is on top. 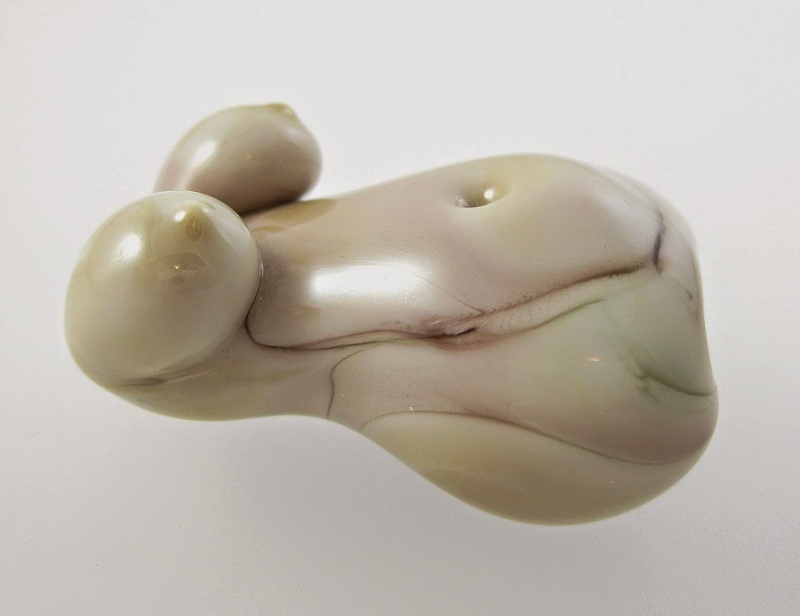 In this goddess bead, you can see the streakiness of Wood and the colour variation you will experience from it in scultpural work. It has struck yellowish in some places, pinkish in others, and then the streaks are a dark brownish colour.